I'm getting ready to purchase a set of these. So I'm price shopping online and I see them on Wal-Mart for 88.00 each for 31x10.5x15, which is a great deal in my opinion. Unfortunately they were out of stock. So I called my towns local tire shop and they are wanting 199.00 each for the same tire. I asked the lady if they do price matches. She said yes, what quote did you get? I told her I saw them online for 88.00 each. As soon I told her who had them for that price, she insisted that those were not real Hankook tires. They were being made by another company so they could be sold so cheap. I politely told her that **** won't work on me. Anyone else run into this crap? and I gave well over 200 each. 88 each sounds way to good to be true lol. How long ago? I see them in the 140's for the 31x10.5x15 at a lot of other online stores. Copies can be found out real quick. Look at the DOT number on a real Hankook and compare it with the number on a suspected one, that is IF it has a number! When I bought my 97 ZJ, it had a worn out set of very aggressive snow treads on it that said "Snowtrecker." They looked familiar, just like the old Firestone Town&Country bias plies, but were radials. Checking DOT numbers showed they were made by a Firestone subsidiary in Canada. I sent the lady the same picture above and she told me that's not them. The tread patterns don't even look the same. So I sent her the picture from the Hankook website. Same exact picture by the way. Then she proceeds to tell me that the tread isn't as deep and the sidewalls are different. Damn woman has lost her mind. Tries to tell me that Wal-Mart has their own brand of all different tires. Well the only thing I could find was that Goodyear makes a specific brand that they only sell to Wal-Mart, Douglas l think it was. And I understand that but they used a different brand and model of those tires. 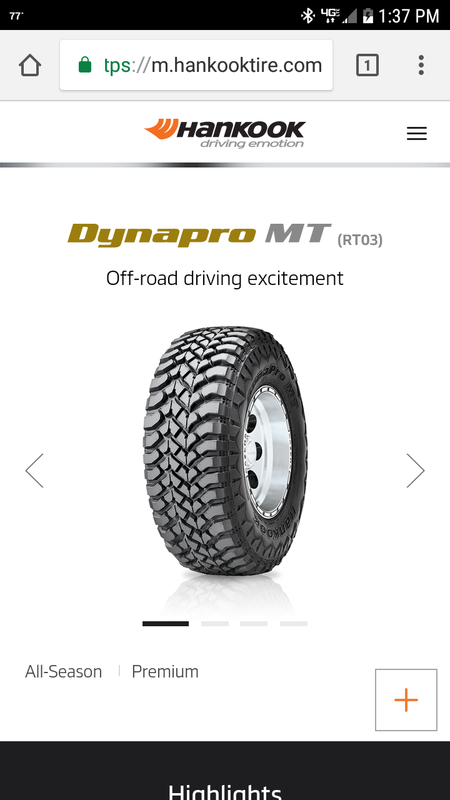 I'm pretty sure that Hankook isn't going to let Wal-Mart use the same brand name and model of their tires if they are made inferior to the real ones. Could you imagine the law suits? Last edited by Richardkempke; 06-12-2018 at 02:08 PM. I even called Wal-Mart and asked them. They get all of their tires through American Tire Distributor, who in turn gets them from each manufacturer. They aren't fake knock offs. The lady at Wal-Mart priced them at 149.00 each through the store. She said they were that cheap online because it was a special buy which is why they are sold out online. 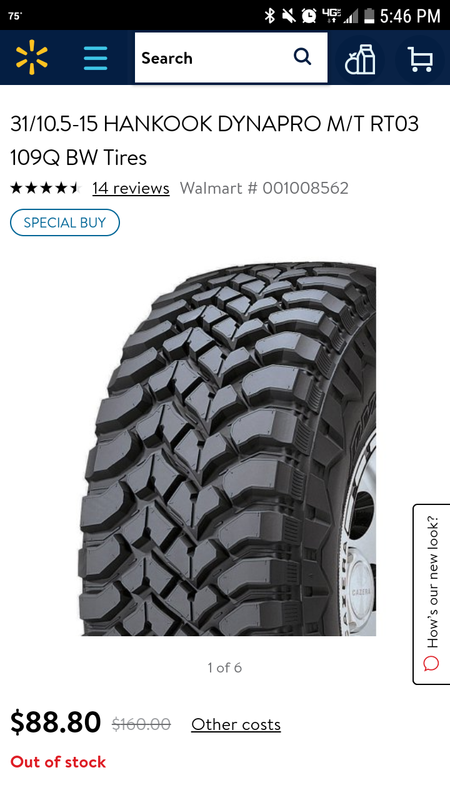 Walmart does have really good deals on tires sometimes on their website. I got my 315/75/16 Mastercraft courser MXTs for my truck for $175 a piece, they normally run around $250 per tire. I just bought 4 Cooper Discoverer AT3 245/70R16s at Dunn Tire for $169 each including mounting, balancing, sales tax, road hazard guarantee and old tire disposal fee. Two weeks later, I got a large nail in one and they fixed it free, no questions asked. I mean, did tou really expect them to price match thag after hearing the price they wantrd? Lol....granted, their price is a bit steep, but you cant really price match a special sale price. Where can I go from Hankook Dynapro ATMs?